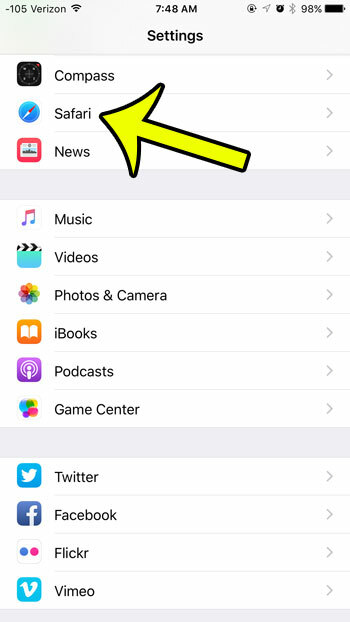 As you are browsing various websites in the Safari browser on your iPhone, certain information will get stored to help improve your browsing experience. This includes the history of sites that you visit, certain files and images for those sites, as well as cookies that store information such as your username and password. This allows you to stay logged into an account on a website so that you do not have to re-enter that information each time you visit the site. But if you find that Safari is running slow, or that there is a problem with your browsing experience that might be caused by cookies, then you may decide to clear the cookies from your browser. Our tutorial below will show you where to find this setting. 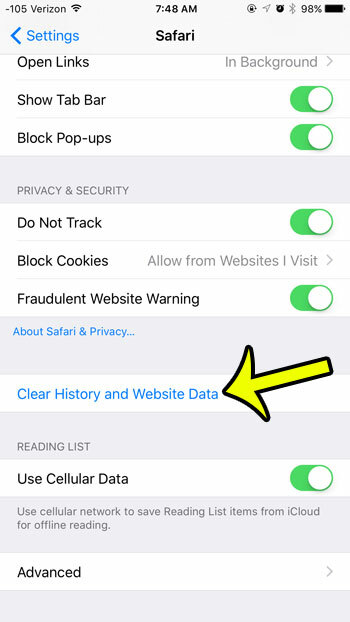 The steps in this guide will delete the cookies from Safari, as well as your history and other browsing data. You cannot undo this option, and there is no way to only delete your cookies without also deleting other website data. Scroll down and select the Safari option. Scroll down and tap the Clear History and Website Data button. Tap the red Clear History and Data button. You will now be able to open the Safari browser and start a fresh browsing session without any cookies, browsing history, or other stored website data. This often has a side effect of making the browsing experience a little faster. If you would like to keep your cookies and browsing data, but would like to start a browsing session where your history is not stored, then consider using Private browsing. This is a great option when you need to sign into multiple accounts on the same website, but do not want to sign out of the account that you are already using. 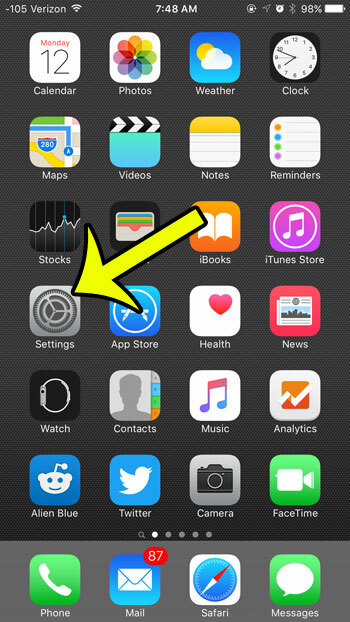 It is also beneficial when you want to visit certain websites, but do not want your activity to be visible on your device by anyone with access to your iPhone.